Before I start writing up this post, I just need to mention that IT SNOWED A LOT YESTERDAY. Just when I told myself I was ready for Spring, and prepared to break out the colourful jeans, the sky threw billions of snowflakes from the sky all over our city. I, being the smartest girl alive, thought that the snow wouldn't be so bad, and would melt upon touching the ground. Wrong, wrong, totally wrong. I trudged through the deep snow in flats, and vowed to never do it again. My feet are still cold, haha. After picking up our pastries, we made a quick detour to Chinook Mall before heading to our hotel to digest our lunch and the numerous pastries we ate. I needed space in my stomach to prepare for an indulgent dinner. When I was younger, I went through this phase where I was unhealthily obsessed with watching Iron Chef. Seriously. Listening to Chairman Kaga shout "Allez Cuisine!" just never got old. That obsession went on to Iron Chef America, then made its way over to Top Chef. Top Chef Canada premiered last April, which is where I first learned of CHARCUT and Chef Connie DeSousa. Watching her throughout the season was so much fun, and I vowed to visit CHARCUT sometime to check out the delicious food! Some people may think that CHARCUT is overhyped, just because one of their chefs was featured on a TV show. 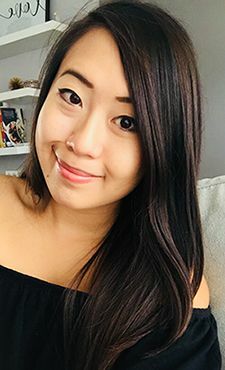 But let me get this out now - this restaurant deserves the attention, and has worked hard to earn its place as one of the most talked about restaurants in the Calgary area. Connie, with her co-chef John Jackson are both very talented chefs, leading the way in Calgary's culinary scene. They consistently advocate for local food, and serve familiar dishes with their own unique twist. Named as one of Canada's top 10 restaurants in 2010, what did I not have to look forward to? There was one thing. Driving in downtown Calgary. I absolutely loathe driving along all the one way streets and I get frustrated every time. 'Nuff said. CHARCUT is located together with Hotel Le Germain, and is quite easy to find. There are a couple parkades in the area, making parking relatively easy, considering that it is located in the downtown core by the Calgary Tower. When we arrived for our 6:30 reservation, we were greeted by a nearly full restaurant, and immediately brought to our seats by the friendly host. Our table allowed us to have a great view of the restaurant, and for us to keep an eye on the hustle and bustle in the kitchen. While the menu changes regularly, there are certain dishes that seem to be permanent residents that are extremely popular. After a quick introduction from our server, we decided on ordering an appetizer, the charcuterie board, and an entree to share. While we were waiting, the server brought a surprise gift from the kitchen to our table! And definitely a gift I would never refuse - thank you again Connie & John! If you ever make it down to CHARCUT, this dish is delicious and to die for! 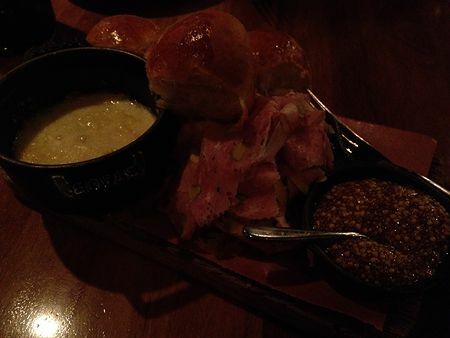 The mild, melted raclette paired with the soft brioche is a delicious way to start off the meal. But if you add in the pigs head mortadella - hand mixed pork, studded with pistachios and truffles - for another element of flavour, you really cannot go wrong with this dish. Thinking about this dish has got me salivating right now. The main reason I ordered the poached tuna dish was because it was a dish Connie put together on Top Chef Canada. Ridiculous, I know, but I don't regret it! I'm not usually a fan of fish, but the tuna had a nice sour, tangy flavour from lemon and herbs that I absolutely loved. At the bottom of the jar were pickled potatoes that tasted great on their own, or together with the tuna, placed on top of the crostini. The side salad of arugula, and celery was fresh, and nice to offset the flavour from the tuna. The next to arrive at our table was the charcuterie board - the table beside us gasped in horror, whispering "holy crap that's a lot of food". So funny, but I was determined to finish it all. From top right going clockwise, we had: the hot Sicilian pork sausage skillet w/ jalapeno, spicy Winter's organic turkey tasso - Cajun spiced and double smoked turkey legs, Lonzino - Italian style bar snacks made with strips of pork loin flavoured with fennel pollen, orange & black pepper, Portuguese Linguica w/ shaved Gruyere cheese - dry aged and flavoured with paprika, Piri Piri & garlic, and another preserved fish pate w/ crostini (I believe it was salmon rilettes? Correct me if I'm wrong!). 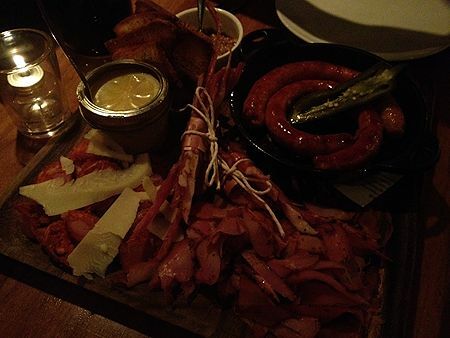 CHARCUT's strengths are found in the house made charcuterie items, and this board really did not disappoint. The only issue I had was with the Linguica - it was quite salty for me, so I wished there was a little more cheese to pair it with. Out of all five, the Lonzino was my favourite! MMmm. Unfortunately, we admitted defeat to the board - mostly because we felt it would be a better option for us to finish our entree at the restaurant. 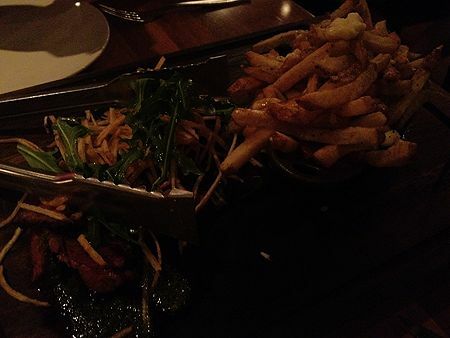 To share, we had chosen the butcher steak (aptly named after the cut that butchers often reserve for themselves), garnished with arugula, chimichurri and fried matchstick potatoes. The side of duck fat fried poutine (w/ cheese curds & truffle gravy) was gluttony at a whole new level for me. The steak was cooked perfectly, tender and juicy, and it was nice to have the different textures of the potatoes and arugula mixed in there. I wasn't quite sure how I would feel about the poutine, but with the first bite, I was hit by the taste of truffles, the exotic taste associated with game meat, and the melted cheese curds. So. Good. At the end of our meal, we sat back with full bellies, ready to roll back to the hotel. I wish I had the room to check out dessert, but I guess that will have to wait til next time. All in all, the food was fantastic! 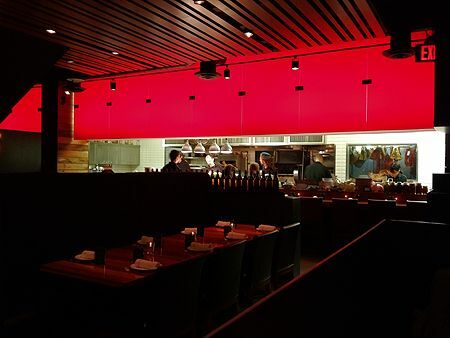 Our server was very attentive that night, and he hospitality at CHARCUT is wonderful. Thank you so much for the wonderful experience! Can't wait to be back. it snowed? wow..in london it is in fact, really hot for spring!! anyways, i hope your spring comes soon! :) Nice post btw! Thanks for your comment :) The foundation is really good, I can only recommend it to you! Snow, how terrible! This all looks very good. Hi Andrea, I feel for you. When we have one cm of snow here, we're moaning already. Lol. We are so spoiled! I've never been to Calgary. 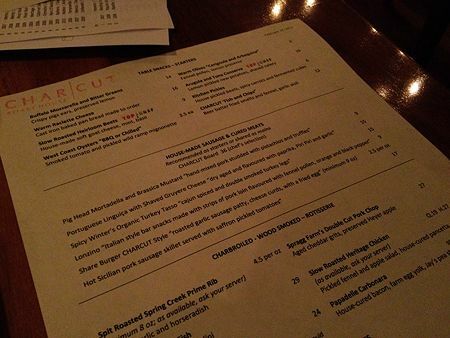 I flew there last year when I was visiting Banff but Charcut sounds so good. I might have to go one of these days. indulge indeed.. that looks soooo good! HOLLLY CRAP that looks like a meal to end all meals!! 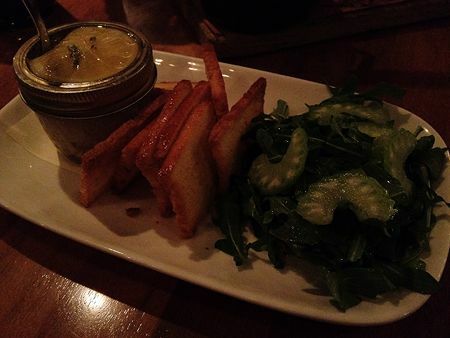 omgggggggg that board looks disgustingly good.. and i've had duck fat fries but.. POUTINE DUCK FAT FRIES???!!! omg sign me up!!! If you're ever here in the area I promise to take you!